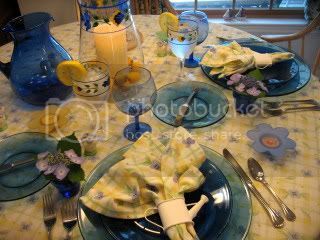 Cuisine Kathleen: Tablescape Thursday~ Summer Breeze Blue and Yellow..
Tablescape Thursday~ Summer Breeze Blue and Yellow.. It is still Thursday...I know most have their posts up on Wed. night, but I never seem to think that far ahead! The charger and plates are from Walmart, as are the blue flower pot votives...They were 25 cents about 5 yrs ago...I bought a lot of them! 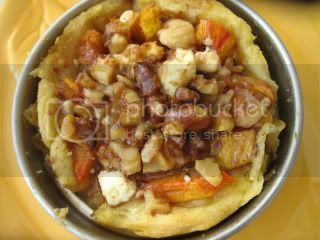 I was using peaches, so I made a tiny savory peach, feta, walnut tart, drizzled with balsamic and honey....tasty! Please join Susan from Between Naps on the Porch for other entries...Thank you Susan for hosting this fun event..
And please join in with Susan at Savoring Time in the Kitchen this weekend for her Garden Party..She is sure to delight! Beautiful table, love all the blue it looks so peaceful. I love your color combination. Everything looks so pretty. Those little salt and pepper shakers are just the cutest. Happy TT to you! Very pretty. Like the blues. Hi Kathleen! Oh, how pretty your table is! 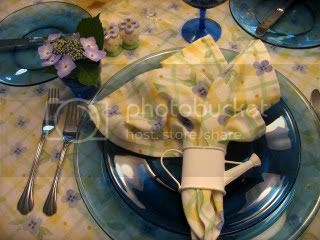 Love your dishes and the tablecloth and napkins are precious! Love the blue and yellow! Kathleen, love your cheery blue and yellow...my favorite color combo. Your table always looks so inviting. 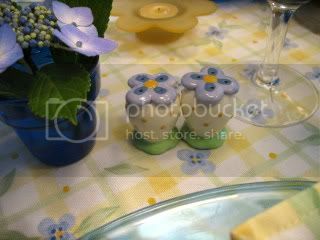 Cute little napkin holders too:) I love the blues and yellow. The little peach tart looks delicious. Thanks for sharing. Beautiful blue and yellow setting. I love the napkin rings and those adorable S&P shakers! 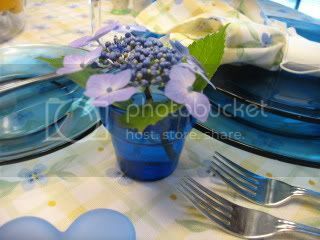 The individual flowers at each place setting is such a nice idea. 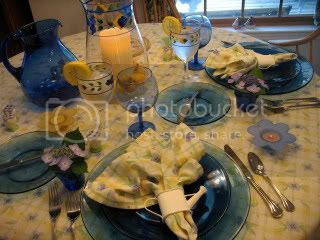 Love the blue and yellow setting...I adore those napkin rings, so whimsical. The savory intrigues me. I have never made one and this sounds and looks delicious! This is all so pretty! Love the s & p shakers, they match the tablecloth perfectly! Great color scheme! Good evening Kathleen! I love blue and yellow together. Your table is fabulous. Oh my that tart is a taste I'm sure I'd love! Kathleen, those salt and pepper shakers are definitely too cute! I love all the blues .. great buys from Walmart. The blues and yellow are so pretty together. Darling napkin rings. I don't think that I've ever seen a lace cap hydrangea ... how beautiful. Such a pretty table Kathleen. I love all the blues and I agree, those S&Ps are a 'Must Have'!! Kathleen your table is so pretty. Those lace caps are gorgeous!! Delicious tart! 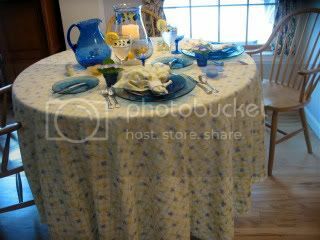 Very pretty tablescape, Kathleen! Great colours! 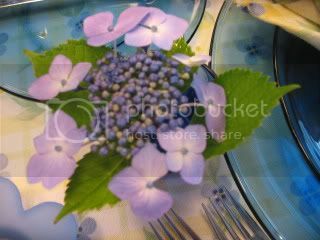 I reallly like anything that is put at each place setting and your little vases of hydrangeas add a lovely touch. The S&P shakers are terrific as are those watering can napkin holders. I'm glad you joined in here later, takes some pressure off me for next time if I forget to get it together and post one on Wed! LOL! Beautiful summer themed tablescape, like all those little details you have added to make it special. Blue and yellow is a favorite combination. Very pretty, Kathleen!